Screaming Bee is pleased to release a new voice-changing product to Market. MorphVOX Pro Voice Changer will provide high-quality voice modification to online games, instant messaging and the professional studio. MorphVOX Pro has a number of new features that improve on the previous version of the voice changer. It includes Backgrounds which allow a user add ambient sounds to disguise their apparent location for fun. MorphVOX Pro users can now sound like they are in the middle of a traffic jam or shopping at the mall. In Addition, voice-changing algorithms have been beefed up for significant improvement in vocal modification. The Voice Doctor wizard can now do voice analysis, make recommendations to the user, and automatically tweak the program for performance. On top of that, Background Cancellation and Hum Reduction (60 Hz) will provide MorphVOX Pro users with the ultra-clean audio quality. One of the premier features added to MorphVOX Pro is the ability to morph an existing audio file or record a voice directly to file. Studios that use this tool can save time and potentially thousands of dollars by enhancing or creating multiple voices from existing stock audio or a single voice talent. And MorphVOX Pro will continue to be used for online gaming. It has a number of features that gamers find useful - such as push-to-talk, sound effects, audio alarms. Online gamers can now sound like the character they play, whether they choose to be an enormous giant or a grumpy dwarf. 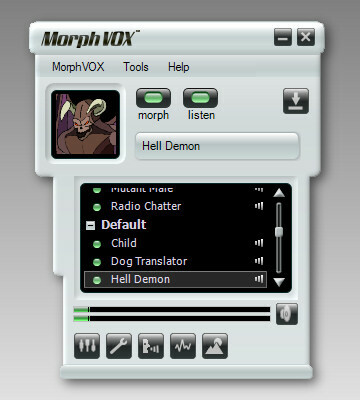 MorphVOX Pro can be used with all online games and also works well with any chat program.